If you're looking for the biggest bang for your buck to become a better grappler these exercises will develop a unique type of strength. Buy all both The Partner & Solo Drills videos together and save: Only $44.99! Download the complete set now! By special request from grapplers everywhere: Steve Maxwell offers a video clinic in grappling-specific conditioning. Witness the breadth of Steve's experience and know-how on this specialized subject. A video compendium of 48 years in the training game -- you will be awed as Steve pulls out move after move from thin air -- is he a coach or a magician? Steve understands a dedicated martial artist hasn't much time nor money to invest in commercial gyms -- or even home gym equipment. Everything shown in these videos can be done in the garage or dojo with homemade or otherwise easily-procured implements, random objects, your own bodyweight, or even your partner as resistance. Before there were gyms as we know them -- milleniums before the Olympic lifts -- how did warriors train for the rigors of combat? Steve Maxwell has done the research and practicum and you can benefit from this wisdom. Steve's perspective on training for grapplers is global -- not local -- traditional, and with an historic eye. Throughout his lengthy career, Steve has been fascinated and obsessed with the timeless, classical nature of physical culture and preparation for combat. In this video series, Steve shares with you what he's learned so far. Lets put it this way: Steve Maxwell has done the work therefore you can trust the integrity of the source -- but wait! Not so fast! It's not so simple as that because Steve can't do the training for you, too! 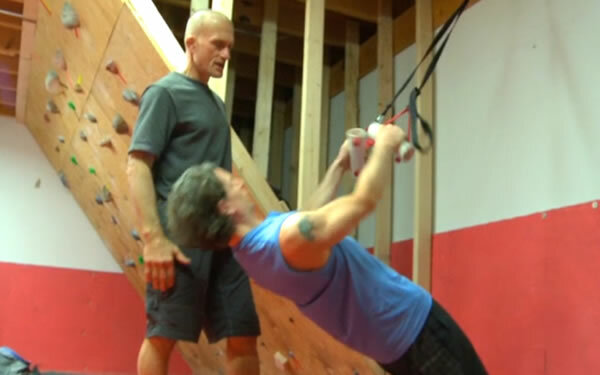 In this video series Steve lays out the exercises -- and the reasoning behind them -- so you can do the hard work yourself with confidence in the plan of action. Steve Maxwell's formidable legacy in martial arts was never a freakish phenom-ability, but a driven -- unmitigated -- discipline. This is an exceedingly rare quality, but something anyone of the right mind can attain. More than drills, Steve provides an example of training diligence and self-reliance for any fighter aspiring to virtue -- no matter their circumstances. Rely on your inner resources more than externals. Discipline the beast and prosper! Do you already own Steve's vintage DVD titles of S&C for Grapplers? Well, get ready for a new attitude and all-new drills. Are you looking for 3-Dimensional Strength? Step inside, son! Steve is ever-evolving but fortunately we can try to keep up with him by video download.